This hop is focused on items you'd want/need to send your child(ren) off for another year of learning!! After visiting my giveaway, make sure you use the linky below to take a look at the other bloggerss and see what they have to offer! Each blog has a minimum prize package of $25 per winner. 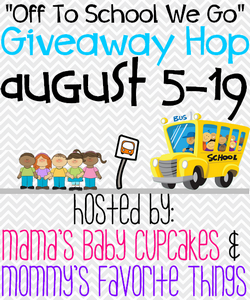 *Disclosure: Mama's Baby Cupcakes, Mommy's Favorite Things and the Off to School We Go participating bloggers are not responsible for sponsors who do not fulfill their prize obligations. At For Your Boys I would get Dinosaur Plush Pillow. I'm most excited for the UMI GC! My little man needs new shoes...so I'd be most excited for the UMI gift card!! I would choose the Dinosaur Monster Hoodie for Boys' from For your boy. I am most excited about the Umi gift certificate, I would love to get my son a pair of their shoes. The umi card! my daughter out grows shoes like crazy! I am most excited about the umi gift card! I am excited about the Umi giftcard! I am most excited about the Below Charcoal Backpack! I like this umbrella http://www.foryourboy.com/item_76/Boys-Knight-Umbrella.htm#.Uf-5LY3VDbM. I'm most excited about the charcoal backpack. It would be great for any of my kids. I'm most excited about the backpack! I'm most excited about the Umi Gift card! Excited for the UMI GC. I love their shoes for my kids! I'm Excited For The Umi Gift Card! I would get the Dinosaur Monster hoodie. i am most excited about the umi shoe gift certificate, thank you! If I won the for your boy GC I would get the Boys Pirate Skull stainless steel water bottle. I am most excited about the UMI GC. I love their shoes! I like the Boys' Monster Long Sleeve T Shirt from For Your Boy. I would be most excited about the Umi prize. I'm most excited about the Umi gift card- love their shoes! I think I would choose the Boy's Robot Backpack for my grandson as he is in preschool. I am most excited about the UMI GC, my grandson needs a new pair of sneakers for the school year so this would be perfect. I would get Trains, Planes & Trucks Backpack. I am most excited about the fruit snacks. They will be so yummy to eat. I am most excited for the Umi GC! I'm most excited about the UMI gc! I'd get the Boys' Monster Long Sleeve T Shirt for my nephew! I'm most excited about the Umi $60 Certificate. I'm excited about the Umi GC! If I won, I'd get the Boys' Construction vehicle Backpack. I think the Umi GC would be the big hit at home. Looking forward to the Umi gift certificate! from for your boy, I would get the boys pirate skull crossbones backpack! I am most excited about the umi shoes gift card! Umi gc! We love their shoes! I'm excited about the UMI gift certificate! Their shoes are so cute. I am excited about the Umi gift certificate. I would choose the pirate lunchbox and water bottle. I'm most excited for the Umi giftcard. I'm most excited about the $60 Umi gc my son needs new shoes for school! I'm most loving the Batman cape! Oh my oldest would LOVE that! I am most excited about UMI! They make quality shoes at affordable prices! My grandson would love the Dragon Shirt For Boys. I am REALLY excited for the $60 certificate to Umi. i'm excited about the umi gc. I would be most excited to win the backpack. I would love to have the Dinosaur Pajamas Set for Boys for my grandson. He loves dinosaurs. He is 4 years old. Id get the blue dinosaur backpack for my son! im most excited for the Umi GC - they have adorable shoes! I would get the dragon t-shirt at For Your Boy. I am most excited about the umi gift card. I am most excited about the UMI certificate! I was exploring their shoes & they have some great shoes that I know my little one will love! I would pick the Dinosaur Monster Hoodie from For Your Boy. I'm excited about the backpack! Most excited about the Umi certficate. They have the cutest shoes! I really like the Dragon Shirts for boys! I love the Umi gc. thank you! My son would love the dinosaur monster hoodie! I'm most excited about the Umi prize. Id pick the outer space raincoat or the pirate umbrella from for your boy. Im excited about umi shoes! They have the cutest selection. I am most excited about the umi card. My daughter is a shoe addict!! I am most excited about the backpack. I really want to try a pair of Umi's for my kiddo! I like the Superhero Batman Dress Up Costume Cape. the dragon shirt at For Your Boy is adorable! I really like the Boys Pirate Umbrella. I'm most excited about the UMI gift card. I'm most excited about the Charcoal Backpack. I would get my son the Batman Dress-Up Cape...he would never take it off! Very excited about the backpack. I'm most excited about the Umi Gift certificate! i'm most excited about the Umi gift certificate. I like the Outer Space Rocketship Backpack Set from For Your Boy. I would choose the MONSTER UNDER THE BED pajamas for my grandson. They have some really cute stuff! I think I'm most excited about the charcoal backpack because my grandson needs a new one. Umi is offering a $60 Certificate is what I would choose. I'm most excited about the Umi gift certificate. Love that brand. Thanks for the chance to win! I'm most excited about Umi! Love their shoes for my daughter. Most excited about the Yum Earth and backpack! I would get my son the Robot Insulated Lunchbox for Boys! The my boy site or the Umi's, they are both great! I am most excited about the umi gift card - we love Umi shoes in my family. The backpack would be an awesome item to have for my daughter!!! I like that the most! i'm excited about the Umi Gift card! I'm excited about the Umi Gift Card. The Umi Shoes, their shoes are adorable!! i am most excited about the umi shoes certificate! my girl is constantly growing!! I might be able to get my son to drink more water with the airplane water bottle. I'm excited about the charcoal backpack. I would get the Boys Dinosaur Insulated Lunch bag from "For Your Boy" and I'm most excited about the Charcoal backpack! At For your boy, I would get the Dinosaur monster hoodie. I am most excited about the Umi GC. Thank you! I like the backpacks super cute! I would like the Umi GC the most! I like the 2-piece monster pajamas! I'd choose the Boys' Monster Long Sleeve T Shirt from For Your Boy. Thanks. I like the For your boy Boys Monsters 2 piece pajamas set Monster Under The Bed.